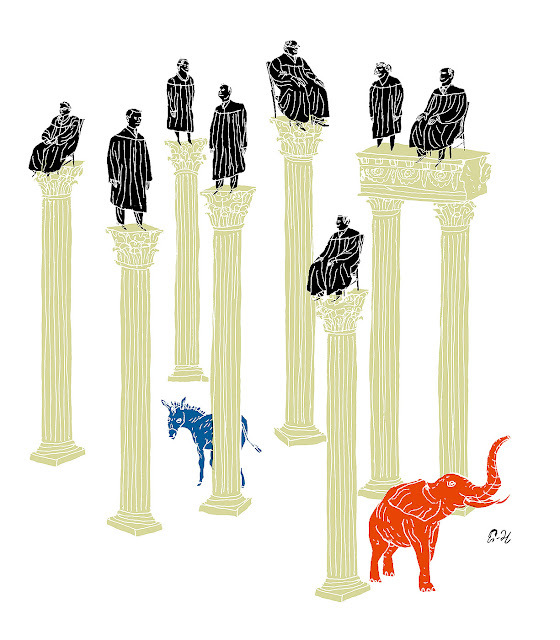 The op-ed I was asked to illustrate in the LATimes was about how the Supreme Court was being endangered by extreme partisanship. So...here is the finished art. It isn't as sharp as I'd wanted to make it. False equivalency standards require both sides be pilloried or neither, which often tends to undermine the point. This art ended up blaming neither party for this episode. In my opinion the old American principle of "majority rules" was exercised by the Republican majority (to take a hypothetical example) as two men might force their wishes upon a 15 year-old girl in a locked bedroom. Or is that too hypothetical? Certainly no self-respecting elephant would act that way.